Internet fraud is growing rapidly. are vital for protecting your identity and brand. Is your digital identity protected? SSL is a standard for encrypting data traffic. It's long been used for sensitive data such as personal, login and/or credit card-information. The trend is currently moving away from using it only for sensitive information, towards being the default standard for all types of websites. 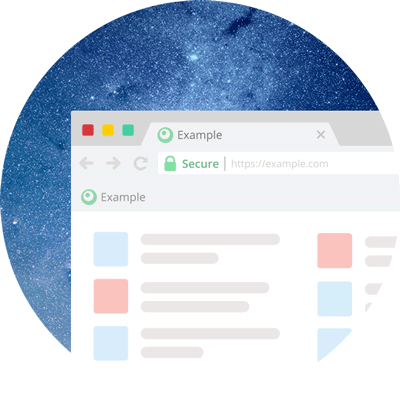 One example of this new found importance is that Google's web browser Chrome now issues a security warning for websites that aren't using SSL. Google has also notified that they will reward sites that use SSL with a higher page rank in their search engine. By letting us help you order and install an SSL certificate on your website you are ensuring your visitor's security. We can also install and configure your DNSSEC and DMARC. Make sure your website is in compliance with these new regulation. In february of this year 20 percent of all websites used an SSL certificate to protect their traffic. This is an increase of 40 percent since the summer of 2016. Besafe.online is a site containing free analysis tools for organisations that want to get an indication of their site’s security status. Besafe.online is created by Ports Group AB. Ports Group is full service partner that actively protects and monitors your trademarks and domain names, on a global scale. We create safety and minimise risk for our clients. What makes us unique is that we take full legal responsibility for your trademarks and domain names and handle everything from start to finish – from hosting services, through active monitoring of your intellectual property rights, to legal disputes – all under one roof. The result of this analysis is only to be viewed as an indication of the security state and not as a complete analysis. Ports Group AB can not give any guarantees that the results are correct due to the information being retrieved from systems outside Ports Group's management, so no business decisions should be based solely on this review. For more information about the results and how Ports Group can help you, please contact us.